Innovation is good! It makes new things possible, old things better and empowers us all to do more. The European Patent Office’s prestigious European Inventor Awards has been called the Oscars of innovation (cool right?). We are so honoured that Jane and the team are nominated this year. It’s thrilling to be part of an event that highlights and celebrates the incredible creativity of inventors from all over the world who use their imagination and skills to make a positive impact on people’s lives. There have been so many amazing past nominations, (which we’ll tell you more about them later), like 3D printing and Bluetooth technology, and more recently, cool innovations like the bike helmet that inflates an airbag on impact, and a super-sponge that cleans up oil spills. As you can see, we’re in good company. 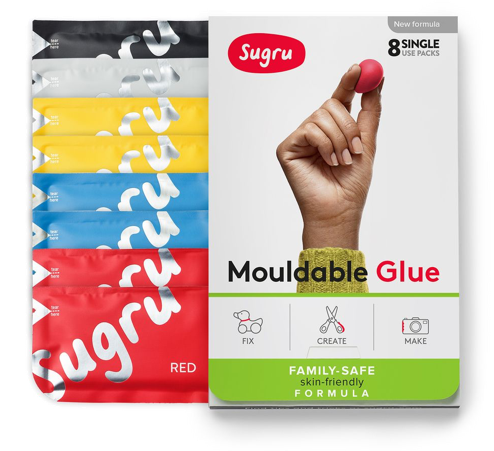 Take a look at this short video the European Inventor Awards made on why they thought Sugru should be nominated. We’re so excited to be part of the awards this year. To help you share in the excitement and spread the love for other great inventions, we’ve put together a list of our favourite nominees from past years. Take a look. By now, we are all painfully aware of the problems of traditional plastics. They use oil, and because they don’t decompose naturally, they cause a terrible, unsustainable amount of waste in our oceans and landfills. The amount of waste created by plastic bags alone could cover the Earth’s equator over 773 times. Bio-plastics made from starch, which were invented by Catia Bastioli and a small team of scientists in Italy, are made from crops and decompose within weeks. It’s one small part of the solution to one of our biggest problems. Energy generation from fossil fuels currently accounts for 28% of our greenhouse gas emissions. Wouldn’t it be cool if we could find a greener, more sustainable way to power our transport and electricity? Hydrogen fuel cells could be exactly that, in theory, when they are burned they only produce water vapour, no nasty greenhouse gases. Unfortunately, in practice, hydrogen fuel cells operate at such high temperatures that cooling them is incredibly expensive and makes them less energy efficient. Thanks to Ben Wiens and Danny Epp, they can now operate at temperatures below 100°C without extra cooling. From portable speakers for home entertainment to cordless mouses in the office and hands-free phones in the car, Bluetooth technology was the first in a range of technology innovations that helped us cut the cord on most of our daily devices. Perhaps the most crucial development of Bluetooth is the way that it changed consumer behaviour helping us all expect and think cordless, connected devices. We all want to move to greener, more sustainable lifestyles, but sometimes the cost can be so prohibitive that it prevents us from taking action. For a long time, this was the case with solar panels. Inefficiencies in the manufacturing process made them too expensive. Horzel discovered a way to improve production and make solar power much more cost-effective. This has helped drive a 40% increase in solar-energy production. And in countries lucky enough to see a lot of sunshine the price of solar energy is even competitive with traditional energy. One of the things we love about Sugru is the way that it empowers creativity. Our little invention is used by people all over the world to design and improve the world around them. Arguably, no invention has empowered innovation as much as 3D printing. The possibilities span so far the mind boggles. From medical advances and aeroplane engineering to architectural models and even toys can now be designed and prototyped faster and more cost-effectively than ever before. Have you heard of the helmet law paradox? When countries introduce mandatory helmet laws, the number of injured cyclists usually goes up. Weird. Experts believe that mandatory helmet laws lead to fewer people riding their bike, making cycling conditions less safe for those that do. Thanks to the “invisible” bike helmet from Anna Haupt and Terese Alsten that may be a thing of the past. The helmet is subtle and sits on the neck like a collar or scarf, but in the event of an accident, it inflates like an airbag. Cycling is fun, environmentally friendly and a great form of exercise, so making it safer and more appealing to more people something we love! The 2018 European Inventors Award will be announced on the 7th of June. Stay tuned on our Facebook, Instagram and Twitter for more news on how we do!